YEREVAN, MAY 11, ARMENPRESS. 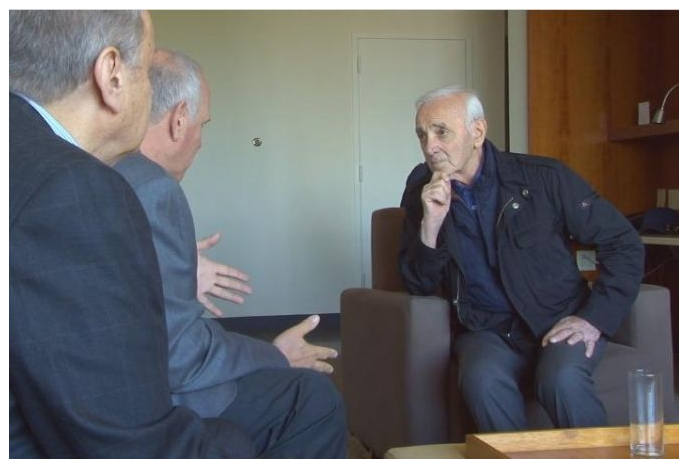 The representatives of the International Raoul Wallenberg Foundation met the legendary singer Charles Aznavour, “Armenpress” reports, singer’s Facebook page informs. During an interview in New York, on May 9 the singer said during the Holocaust, his family gave shelter to Jews and Armenians who fled from the Nazis. “Me and my sister were sleeping on the floor”, the singer said, however, he could not remember the names of the people whom his family saved. The representatives of the foundation introduced Aznavour the creation and the goals of the foundation. The singer said he wrote songs for Armenians and Jews. “Germans learned from the Armenian Genocide”, the singer stated speaking about the Holocaust. During the talk the singer introduced himself, told that he was born in France, however, he stated he considers himself Armenian. Aznavour told how his parents met each other in Istanbul, then they got married. He said he went to Israel with his grandson several years ago, and his grandson’s Bar-mitzvah ceremony was held there since his father is a Jewish. Aznavour also did rumors during the talk. “Once a Jewish woman came to me, looked and said: I know you”. I said “Probably”. She said: “You are actor. No, you are that singer”, What is your name?”. I said “ Aznavour ”. “Avenbur”, she repeated. I said “Yes, yes”. She was very happy”, Aznavour said. Prominent French-Armenian singer, songwriter, actor and public figure Charles Aznavour was born on May 22, 1924, in France. He is an author and performer of numerous songs. He has sold more than 100 million records. He is the Ambassador of Armenia in Switzerland since 2009, and the permanent representative of Armenia in the UN Geneva Office and other international organizations. Legendary singer hold a concert in Armenia on October 10, 2015, visited different places and gave an interview to “Armenpress”.